Due to the refurbishment of the house and construction of a new infinity edge pool, the garden was in need of restoration. 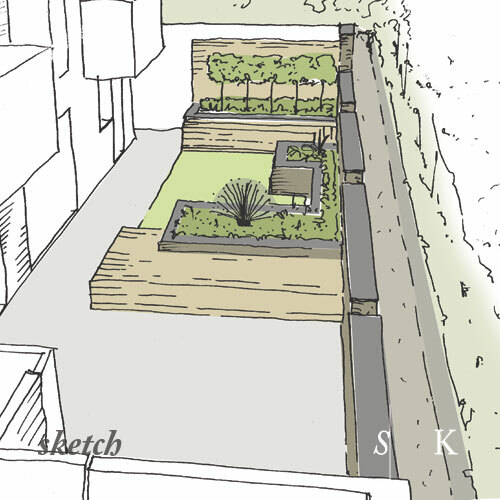 The proposals had to tie in with the sub-tropical feel of the existing garden. Fresh and fragrant plants were to be incorporated, where possible. 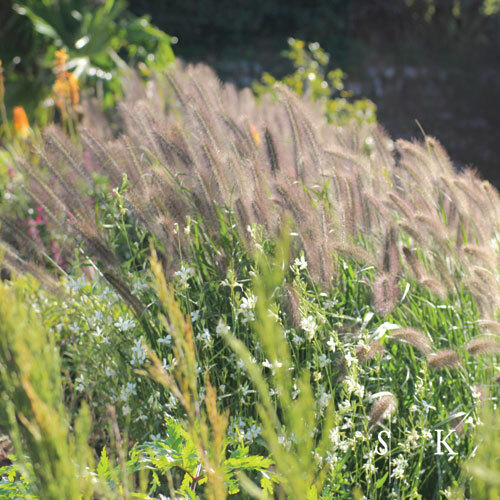 Late summer and early autumn colour was required to extend the flowering season of this Cornish garden - especially during the first year after completion. Creating a garden that feels well established within just one year, I wanted to keep the sense of wonder I felt, discovering magnificent magnolias, acacias and camellias flowering in the winter. Dedicated to preserving the subtropical feel of the existing garden, the garden to amazes and surprises by the hidden fragrant plants, that will catch on the breeze throughout the year. Extending a late summer and early autumn with vibrant colours is one way this garden keeps giving year-round interest. Once again I worked with Illumina Lighting in Cornwall. Claire added gentle lighting, turning the garden into a mysterious and mesmerising space as dusk settles its inky fingers over the Helford River. The following images show impressions of first site meetings, the development of the design and progress on site. 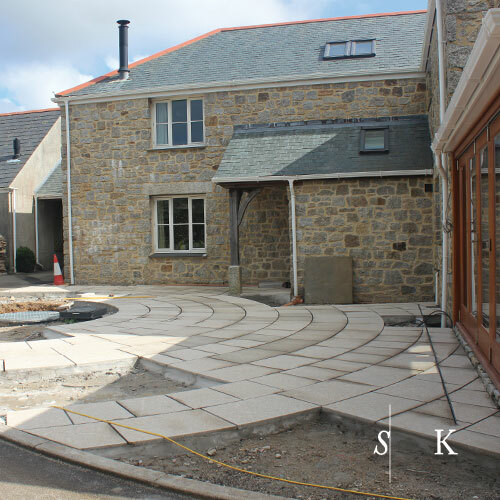 The former garden of this new home in a Cornish village was a simple solution of lawn with a paved path connecting front and rear garden. 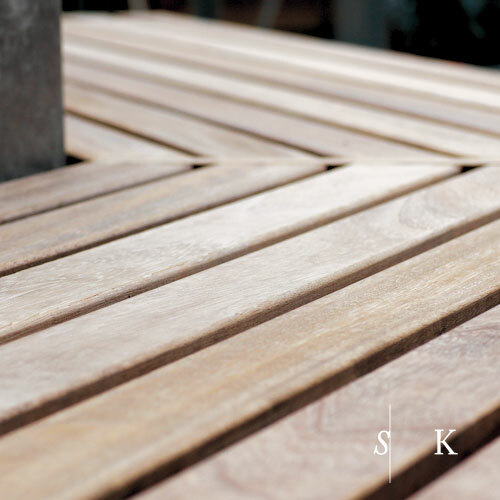 The dream of a usable productive outdoor space soon meant that something had to be done. A sleek and unconventional glasshouse was the start of the new productive garden. 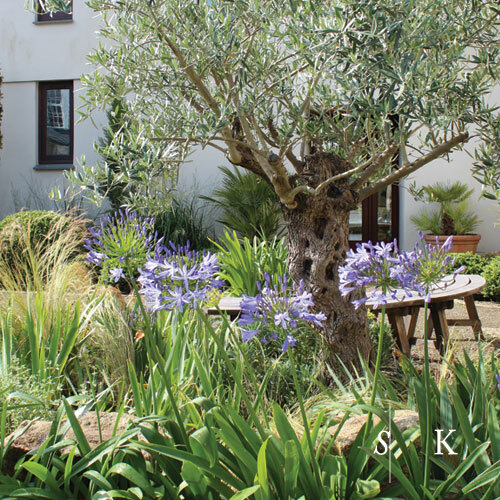 The brief lead to design a contemporary garden with a traditional Cornish feel incorporating growing spaces and unusual plants as as seen travelling to Italy or the Isles of Scilly surrounding the new glasshouse. Treasuring the history of the former Piggery, I mixed traditional local craft and materials with modern elements. 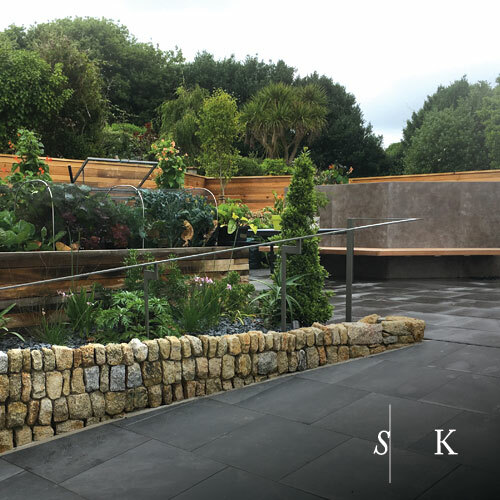 The garden features a variety of hues of grey within the materials: Charcoal Porcelain paving meets 'blue' stable pavers. Cornish granite meets ceramic clad walls. Cedar slatted fences meet chunky weathered oak growing beds. 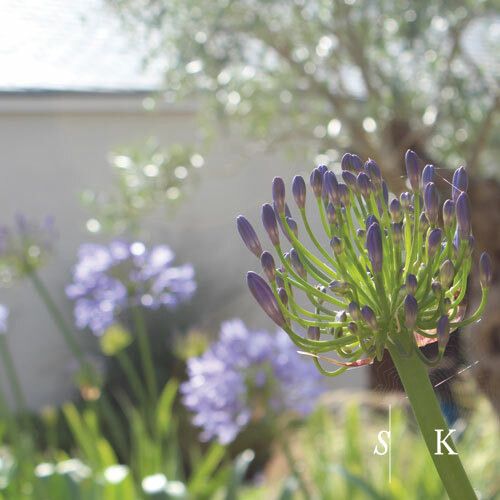 The garden is a heaven for the keen horticulturalist: Indigo blue Agapanthus, succulent Aloe and architectural Restio originating from South Africa - Loquat for a Mediterranean feel - Echium, Aeonium and Geranium from Macaronesia. After a day of devoted care in the productive garden, it is time to sit back and watch the finest tomatoes turn red, pick the first French beans and enjoy the view with a glass of slightly chilled Lambrusco from Italy paired with anti-pasti and artisan bread. Redesign an existing garden space and link with the newly built extension and existing farm house. Include an antique granite cider mill and transform into a bespoke water feature. The old granite cider mill tells the story of the ever hard working mare pulling the weighty wheel, pivoting round the central point of the old granite cider mill. Crushing fresh juicy apples, she ploughs on, round and round and round. 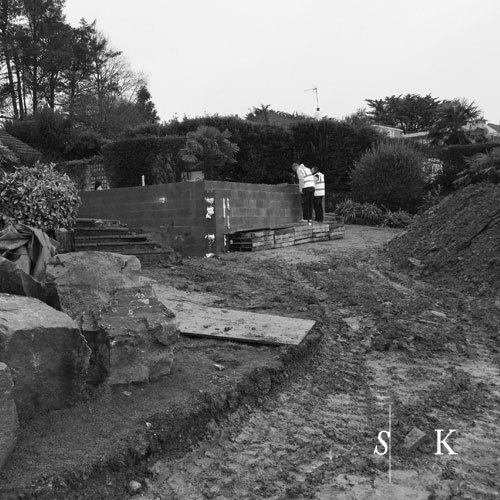 The worn Cornish granite cider mill was carefully placed and settles in the centre of the Cornish Farm Garden. 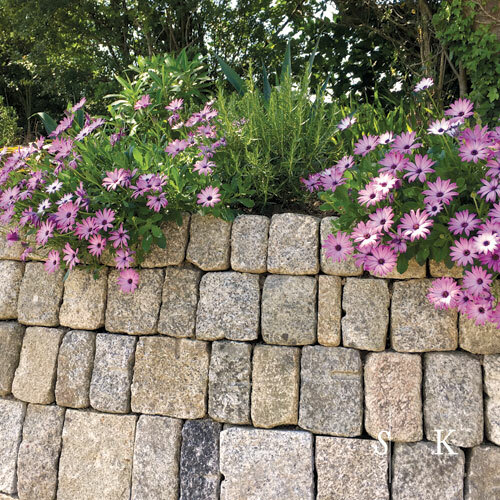 The circular pattern of water ripples echoes in the surrounding heavy granite paving and elegant planting of ornamental grasses and perennials. A difficult shaped terrace has transformed into a tranquil outdoor room. Setting out the intricate pattern for the granite paving. Breathing in the heady Cornish air, I was transported to Mediterranean fields and immediately I thought of Irises. Latin for rainbow, the flower indeed comes in a variety of colours. Adding in pathways gives this small and practical garden a secret feel to it. The wonderful lighting was designed by Illumina Lighting, Cornwall. 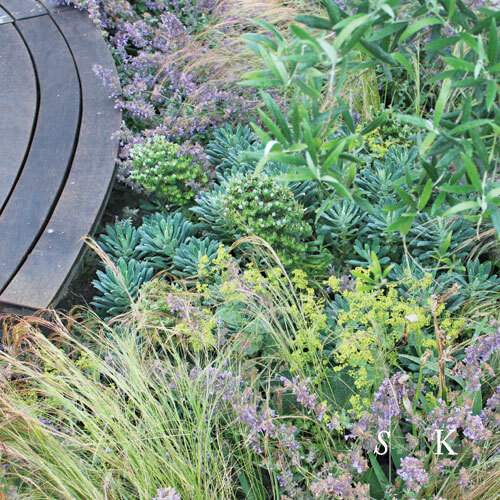 Design of planting beds with mature feature plants and interest all year. 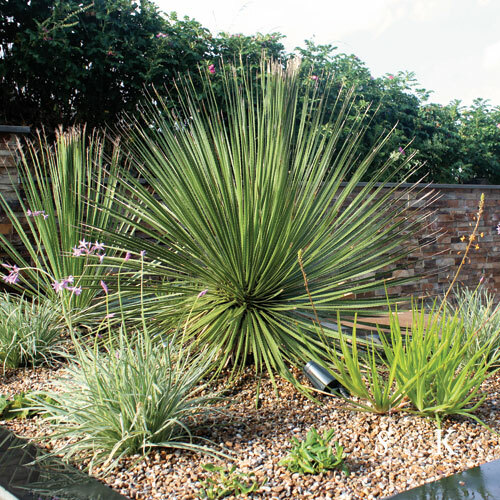 In this design, I chose ornamental grasses in combination with palms and deciduous shrubs to create an earthy, natural looking garden. Pastel perennials give it a soft and magical edge in spring and summer, followed by a great display of colours of witch hazel and fothergilla in autumn before the leaves fall. Then again in the depths of winter, the secret but richly perfumed blooms of witch hazel and viburnum burst into life . Meadows come alive at various stages throughout the year, as much for their insect life as the changing plants that bring colour throughout the seasons. Perennials and ornamental grasses blended the garden to its surroundings. 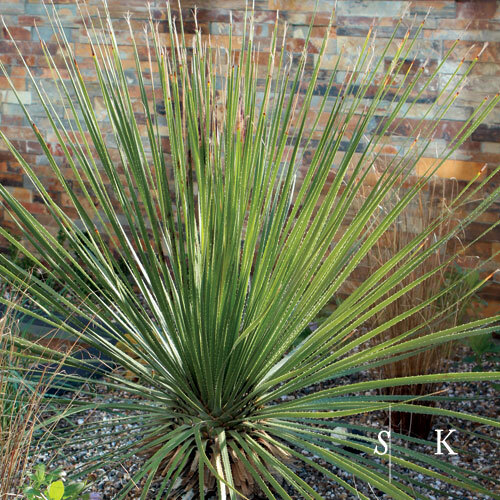 Such plants house insects that create an evolutionary soundscape all year round. Yew hedges were added, creating a juxtaposition between formal and informal and defining the garden from its meadow. 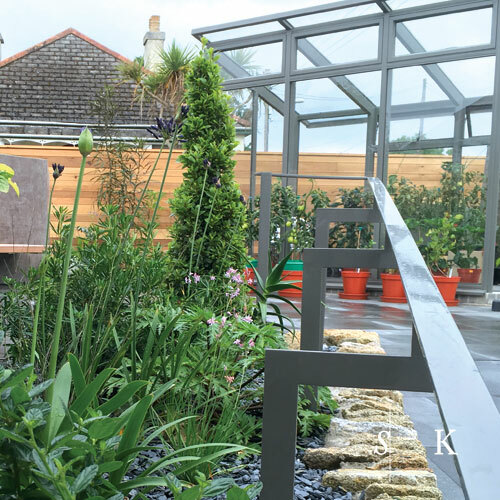 Create a garden space complementing a stunning, contemporary new-built near the Cornish coast. The garden's formal lines in structural features and architectural planting enhance the architect's vision. 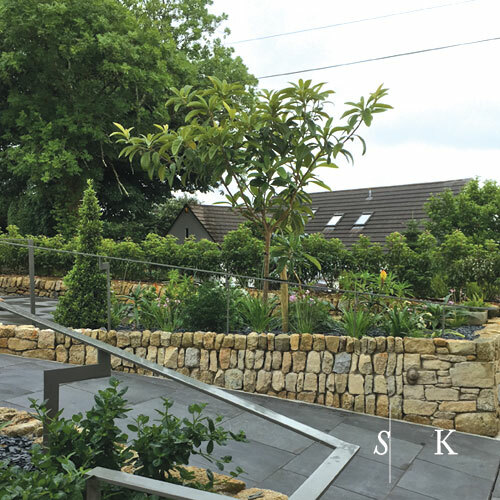 Earthy tones of stone and the honey coloured timber support the green and silver hues of the planting. Sheltered from the prevailing wind, the new garden embraces three sitting areas, which allow for sunbathing and outdoor dining alike. The wonderful lighting was designed by Illumina Lighting, Cornwall. The client asked for a border revamp with colour all year to include cut flowers and a selection of favourite plants. 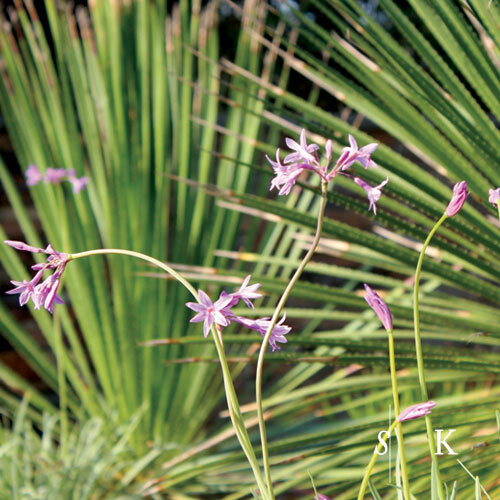 The new perennial border includes a great variety of perennials, grasses and evergreen shrubs. Hues of green, grey and silver create a backdrop for an array of pastels which vary as as the seasons change. Wait for the winter months, when a beautiful display of colour will lighten a dull and grey Cornish day. A fusion of succulents, ferns and ornamental grasses as found in some of the world’s secret coastal areas give away rich textures and opulence. Glaucous, silver, mauve and nearly black foliage blend together effortlessly. A Smoke-House nestles among rare plants and the raw crust of Cornish granite as its herringbone pattern complements the surrounding textures of pines and wispy grasses. The charred wood reminds of smoky, culinary treats slowly maturing inside. The fresh scent of pines and kindling sticks, ochre needles and orange tinted ornamental grasses add rustic warmth. A garden to delight, enchant and inspire. A slight breeze rustles the long grass, and on it drifts the distinct scent of a clear coastal morning in late spring. It could be a bonfire or a barbecue, but when the days are getting longer and when the first school of mackerel appears, the smell of smoke carries the flavour of curing fish and the promise of good, slow eating. Echeveria ‘Duchess of Nuremburg’ Echeveria var. Leucadendron ‘Safari Sunset’ Leucadendron var. Magnolia ’Black Tulip’ Magnolia var. The brief for this bespoke fence was a light dog-proof barrier. One of my projects features two hanging baskets. I have designed these to complement a set of exquisite terracotta planters. 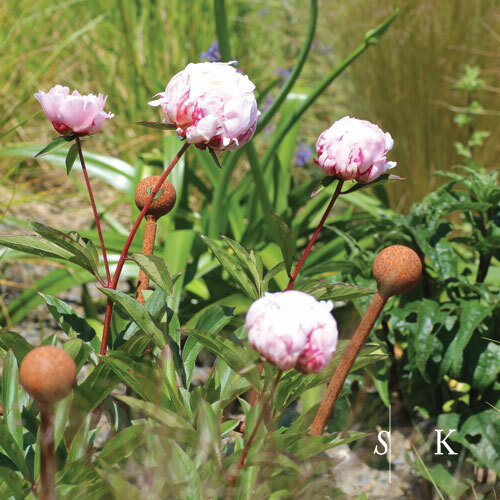 Whether filled with seasonal plants or on its own, these will add playful elegance and sophistication to the garden. According to my design, the bespoke baskets were forged in Cornwall by Steven. Then sent away, galvanised and painted. Soon they were ready to be lined with a reinforced coco liner, which I made to measure. The first planting is a show stopper nonetheless. The rich purple foliage and pink flowers of Tradescantia 'Purple Sabre' are a beautiful bold statement. In contrast I have planted Erigeron karvinskianus and Euphorbia 'Diamond Frost' for a light, whimsical feel, which adds volume at the same time. I design bespoke Garden Sculptures and Planters according to my client's wishes. 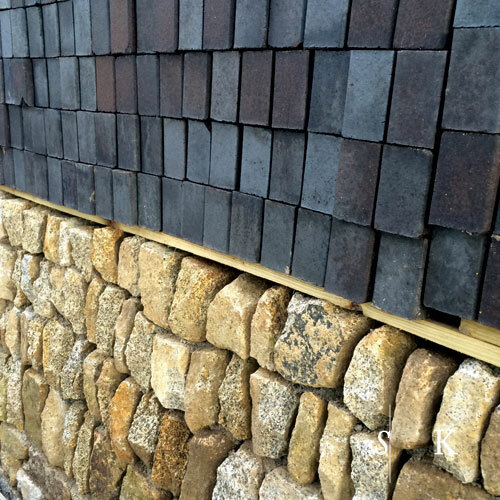 They are made to last a life-time and will withstand the harsh Cornish weather. 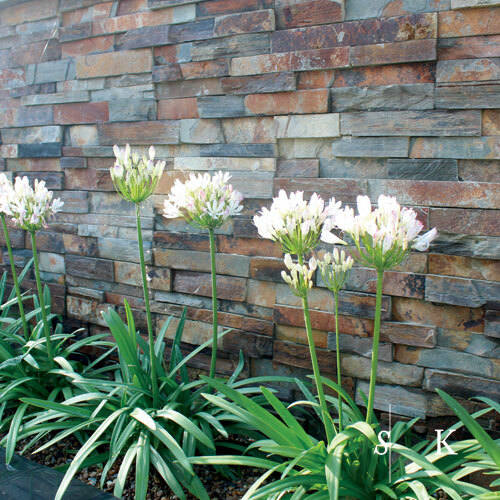 Each peace is unique and will enhance a new or existing garden scheme.